The Puffstool (ボケナメコ?, lit. 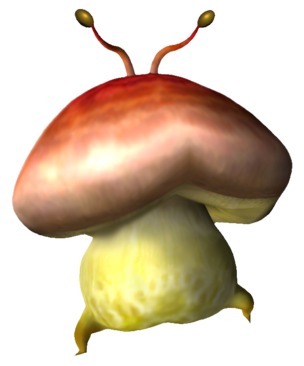 : "Stupid Nameko") is an enemy in Pikmin that appears to be a huge walking fungus, strongly resembling a red-capped bolete. It has twin antennae, a red-capped mushroom head and a tender yellow torso which is vulnerable to swarming. Only minimal details of the creature's biology of the game are supplied. The Puffstool is one of the enemies with which the crushing glitch happens fairly regularly; the frequency increased in the Wii version of the game. The Puffstool will try to run when attacked, but its legs are clearly not made for sprinting and it trips easily, landing on its head with feet in the air. Since the cap is invulnerable to attack, Pikmin must be thrown onto its undersection once it's on the ground. After a few seconds, the Puffstool will right itself up and blow out a purplish cloud of spores which cause a strange change in nearby Pikmin, which the Puffstool acts as a leader for. Affected Pikmin turn purple, grow small brown mushroom caps on their stalks, and become aggressive. These Pikmin are known as Mushroom Pikmin. To quickly dispatch the Puffstool, the player should bring about 80 Red Pikmin into its arena. First swarm its legs with about 30 Pikmin. Don't throw the Pikmin, as they'll just bounce off of its cap and return to the group. It will try to run away, but flip over, legs flailing. In this state it can be killed by throwing all remaining Pikmin on top. It will die, and appear to deflate, leaving its cap, which can be carried by 10 Pikmin to their Onion. To minimize the risk of losing Pikmin, it is recommended to attack only with the leader. Furthermore, the Puffstool has no attacks that could harm Olimar. Note, however, that this may consume a fair amount of time, and as the sporing habits of the Puffstool are fully predictable, having Pikmin turned into Mushroom Pikmin is usually not a problem for competent players. Should you run the risk of being attacked, however, just run away until the spore cloud dissipates. It is also possible to drop some bomb-rocks on its feet, but because it is always running this can be hard, unless the creature is cornered. A successful explosion should sap away a quarter of its health. Some regular Pikmin and some Mushroom Pikmin near a Puffstool in an early version of the game. A single Puffstool can be found in The Forest Navel, where it holds the Omega Stabilizer. Once defeated, its cap can be returned to an Onion where it will produce 30 Pikmin seeds. Two Puffstools can also be found in The Distant Spring in Challenge Mode. According to the early screenshot to the right, a Puffstool would have appeared in The Forest of Hope on the plateau overlooking the small body of water where the trio of Burrowing Snagrets are in the final game. The name "Puffstool" is a combination of "puff", referring to how it blows out spores, and "toadstool" (mushroom), referring to its appearance. The "puff" can also come from the name "puffball" which is given to any fungi in the division Basidiomycota. Its Japanese name is ボケナメコ?, which translates to "Stupid Nameko". A nameko is a type of mushroom, and the adjective stupid is because of its appearance and behavior, mostly over how it trips when running away. Internally, the enemy is known as kinoko, which is the Japanese word きのこ? (lit. : "mushroom"). The Puffstool in the enemy reel. A Puffstool in The Distant Spring. If the player kills the Puffstool as it begins to get up, it will still do so and release its spores with its health indicating it is dead; a similar effect occurs when a Wollywog is defeated when jumping. There is an enemy in The Legend of Zelda: The Minish Cap called the Puffstool, which has a similar look and size; however, they have different Japanese names so the reference is likely unintentional. When it flips onto its cap, it makes the same sound as the Anode Beetle flipping over. Occasionally, if Pikmin are carrying the remains back to the Onion in The Forest Navel, they will be unable to cross some of the bridges that lead back to base, rendering the remains uncollectable. The Puffstool's ability to control Olimar's Pikmin with its spores is possibly based on a real fungus called cordyceps, whose spores take over an insect's nervous system and force it to help the mushroom. This page was last edited on February 23, 2019, at 16:16.